Apple is expected to provide additional details about watchOS 2 at its September 9th media event in San Francisco. Alongside that announcement, a trio of rumors hint towards Apple expanding Apple Watch sales to Austria, Denmark, India and possibly other countries later this month. 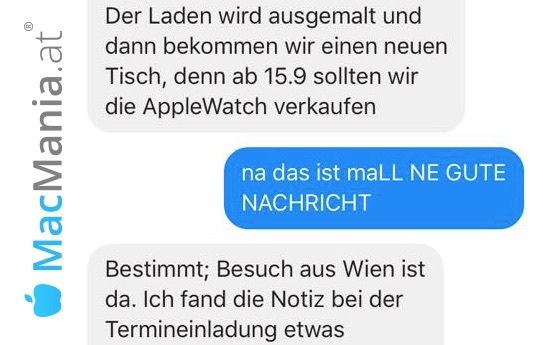 Austrian website MacMania claims that the Apple Watch will be available in Austria starting September 15, citing information it received over Facebook Messenger from a reputable source working for an undisclosed large electronics chain in the country. Apple does not have an official retail presence in Austria. Danske Bank, the largest bank in Denmark, also recently issued a press release stating that its MobilePay service will support the Apple Watch when the device launches in Denmark next month (via Rec.dk), but the bank has since backtracked and now cites "rumors" about a September launch. Danske Bank has a large presence throughout the Nordic region of Europe, with locations in Denmark, Finland and Norway, three countries where the Apple Watch is slated to launch before the end of the year per Apple's website. The bank also operates in Sweden, where the Apple Watch launched in July. Indian website iGyaan claims that the Apple Watch will launch in India in September, starting at Rs. 24,999 for the entry-level Apple Watch Sport. "However we have some good news for those waiting to get their hands on the device," the report said in late August. "It arrives in the country next month." The full list of countries where the Apple Watch will be "available in 2015" includes Austria, Belgium, Brazil, Denmark, Finland, India, Malaysia, Norway, Saudi Arabia and the United Arab Emirates. Apple also has an Apple Watch preview website live in Latin America, but no launch date is provided. April 24: Australia, Canada, China, France, Germany, Hong Kong, Japan, U.K. and U.S. It should be noted that all four dates listed above were Fridays, so there is a possibility that Denmark's rumored Apple Watch launch date of Tuesday, September 15 is inaccurate. But with "iPhone 6s" and "iPhone 6s Plus" pre-orders expected on Friday, September 11, ahead of a Friday, September 18 launch, and watchOS 2 expected midweek, Apple could go for an unusual date. Maybe it's just me, but a launch without any products available to be sold is not a launch. April 24 was a mess not a launch. Everything seems to be good now, but can we please not call April 24 a launch? Thank you. Shouldn't they just release the watch once everywhere. By now they could've had an Apple Watch 2 or something. Sehr gut! Willkommen auf der Apple-Watch! Very good! Welcome from the Apple Watch! I'm not going to shell out that kind of money for a 1st gen product that's about to be replaced soon anyway. I hope they'll make the 2nd gen version available much faster. Very good! Welcome to the Apple Watch! Sehr gut! Willkommen zur Apple Watch. depends, where exactly you're coming from. "launch" can be used to refer to the unveiling of information about a product, usually in the context of a subset market. whereas "release" would refer to product availability. Isn't this kind of a bit late? Apple should have launched this worldwide within three months or earlier of its initial launch. 5 months later and other countries are still in the dark with the Apple Watch? Good Lord, and here I hought the U.S was always second in line for all the good stuff. Scandinavian has some of the worst cronyism for retail distribution throughout Europe. These countries distribution agreements are based very long term contracts setting up rigid vertical arrangements to where you can trace every product on a retail floor to the cargo ship, docking and unloading time and even shipping crate. While the party line is "quality and security control" the reality it is all about keeping competition from bypassing a merchant tradition going back to the middle ages. Some of the families running these distribution chain goes back centuries. This is why you don't see an Apple Store in Denmark.